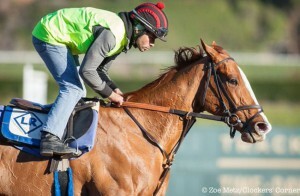 Hot City Girl a Theft Candidate in La Brea at Santa Anita: Cavorting comes into the La Brea Stakes (GI) on Saturday, at Santa Anita Park, as the deserving favorite for the powerful Stonestreet Stables. Bettors searching for an alternative are not left without a choice though. Hot City Girl, the little sister of Breeders’ Cup Filly and Mare Sprint (GI) runner-up La Verdad, will attempt to carry her sibling’s torch this weekend. She rides a “hot” streak of three wins in a row, plus an equally impressive loss four starts ago. Her connections include the team of Linda Rice and Lady Sheila Stable. Back in July, Hot City Girl finished fifth in the Mother Goose (GI) at Belmont Park, in a performance much better than the result suggests. Eager to set the pace early, Hot City Girl ripped through swift fractions which BRIS rates 20 points above par at 1c and 15 points high at 2c. If anyone fails to understand, just know Hot City Girl went at a scorching pace and the pace collapsed, paving the way for late runners to dominate. 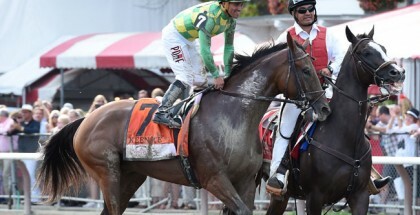 The now-retired Embellish the Lace chased her in second before fading herself to ninth, or second-to-last place, and returned later to win the Alabama (GI) at Saratoga Race Course in a strong wire-to-wire effort. Hot City Girl raced again in September and captured the Charles Town Oaks (GIII), before reeling off two more victories at Belmont Park and Laurel Park, the latter with a margin of over eight lengths. Last week, Rice sent out Hot City Girl for a morning spin at Santa Anita and sounded pleased in a press release. Jose Ortiz will let Hot City Girl roll from post position two, and whoever goes with this filly will certainly end up burned on the pace. Pay attention to the dirt surface for any helpful clues on a speed bias. Cavorting, starting from post position three, recently finished fourth in the Breeders’ Cup Filly and Mare Sprint. Otherwise, the daughter of Bernardini is perfect in all other sprint races. Despite the loss at Keeneland, Cavorting still put in a good run to finish less than four lengths behind. Capturing the La Brea could propel Cavorting to an Eclipse Award because no clear leader in the female sprint division exists (partly due to the lack of Grade I events in this category). While horses exiting the Breeders’ Cup are generally tired, the connections will want the Eclipse Award and Cavorting should enter this race primed. “She’s certainly fit and ready and a fast filly,” Neal McLaughlin (brother of Kiaran) said. Her lack of early speed remains a problem. Cavorting will drop back and make one run, but if no pace materializes to soften up Hot City Girl, giving up so many lengths early can cost her. The other contenders are not so enticing. Sure, from the rail Birdatthewire might pick up a share towards the end. Overall though, the early-season Gulfstream Park fillies disappointed when sent elsewhere. In post six, Ben’s Duchess will attempt to prove the strength of her local three-length win in the L.A. Woman (GIII) over Uzziel and Taris. Did she benefit from a scorching pace? She holds a reasonable shot. Next to her, Rattataptap will attempt to justify her 250k price tag. After an impressive win over synthetic to kick-start her career last fall at Del Mar, she has disappointed for the most part. Pleasant Tales also ships from east of the Rockies for this race, and she ran close to the Mother Goose pace too while holding on for fourth. Her subsequent efforts are not indicative of how well she ran. If anyone dares to challenge Hot City Girl, the race becomes interesting. Otherwise, expect the speedy filly to hold on and take her first graded stakes victory. Watch out for Cavorting as well, and throw in the rest underneath. The race begins at 3:30 PT, just before the Malibu as Race 7. Plan those late horizontal tickets right now!